Recent studies have revealed disturbing trends amongst Americans. Prescriptions for anti-depressants have doubled in the past decade and the death rate in one segment of the population between ages 45 and 54 has actually increased due largely to drug and alcohol abuse and suicide. This news is alarming as it breaks with the overall trend toward an increased life expectancy. There are plenty of theories as to why this is occurring, but the real cause behind these “deaths of despair,” as they are being called, is nonetheless difficult to grasp. There are no easy answers to such systemic problems, but there are plenty of things we can do right now to move toward a better tomorrow. First and foremost is to recognize that we as individuals do have the ability to take an active role in creating the future we desire. But this active role requires us to engage in meaningful dialogue and purposeful action. Which means we have to accept that not everyone is going to see things the way we do and, furthermore, recognize that this diversity of viewpoints is the key to finding real solutions. The world is not black and white and the more we try to make it so, the more frustrated we will become. 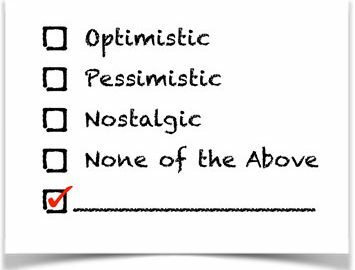 When the option you prefer is not available, you have one of two choices: select “none of the above” or write in your own.